Catch the Bus Week 2015, it’s a wrap… until next year! Catch the Bus Week 2015 was our biggest and brightest campaign week yet. We saw events, competitions and community initiatives taking place all over the country, all aimed at encouraging people to give the bus a try that week. In recognition of the vital support from local authorities, operators and passenger group during Catch the Bus Week, we have developed this exciting report which outlines all the activities that took place that week and highlights all the people who went above and beyond for the bus that week. Running from 29 June – 5 July 2015, over 215 groups from all around the UK got behind the bus that week, with many more local people involved through competitions and events. 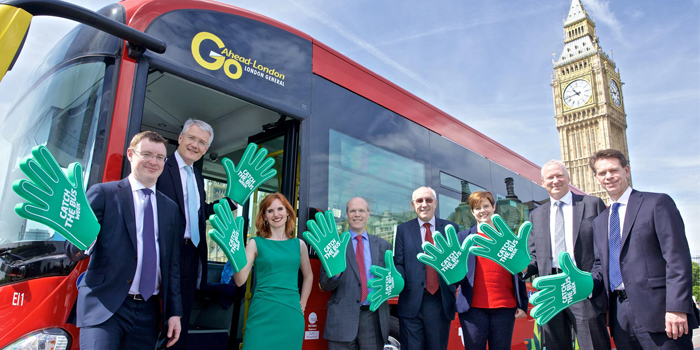 Catch the Bus Week 2015 was hugely successful in helping to connect local people and demonstrating the importance of the bus in helping to bring communities together. From a local dance troupe entertaining bus passengers to a competition for the best ‘bus selfie’, in addition to MPs visiting their local bus depot to meet employees and passengers, Catch the Bus Week 2015 put the very best of the bus on show this year. We are so grateful to all that got involved and we are already getting excited for next year’s campaign which will run from 4 – 10 July 2016. We hope that even more people getting involved next year. So get those thinking caps on and sign up here to register your support. We’ve tried to capture all of the fantastic activity that went on during the week, but if you feel like we have missed you out, please let us know! We hope you enjoy this report, and that it provides some inspiration for next year. Good luck with the planning!